Pagina prima libri Caroli Darwin, De Origine Specierum (anno 1859). 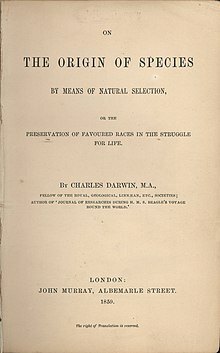 Anno 1842 Carolus Darwin primam adumbrationem libri On the Origin of Species facturi scripsit. Evolutio sensu latissimo dicitur quaeque variatio lenis in tempore. Sensus vocabuli etiam progressio et incrementum est. In biologia autem evolutio praecipue dicitur lenis specierum mutatio, quae per aetates accidit. Circumiectum naturale et mechanismi biochemici una variationem geneticam intra speciem continue creant. Hae differentiae geneticae inter res animantes efficiunt, ut aliae ad vitam aptiores sint, aliae minus aptae. Ipsum circumiectum naturale res animantes vitae aptiores tunc necessario selegit, numerum vitae aptiorum augens. Haec selectio dicitur selectio naturalis. Experimenta monstrant gena per tempus mutari, ob radiationem, vira, transposona, chemicas mutagenicas, et varia errata, quae, dum ADN replicatur, in meiosi accidunt. Hae mutationes effciunt, ut singula animantia cognata inter se de eo, quod ad vitam feliciorem adduceat, discrepent. Selectio naturalis dicitur mechanismus, quomodo circumiectum naturale res animantes ad vitam aptiores citat. Res aptiores vivunt et novas progenies habent, quamquam res minus aptae excidunt carentque progeniebus. Ita circumiectum naturale rerum animantium numerum auget aptiora adiuncta genetica habentium, et numerum eorum diminuit, qui minus apta adiuncta habent. Carroll, S. 2005. Endless Forms Most Beautiful. Novi Eboraci: W. W. Norton. ISBN 0-393-06016-0. Charlesworth, C. B., et Charlesworth, D. 2003. Evolution. Oxfordshire: Oxford University Press. ISBN 0-19-280251-8. Dawkins, R. 2006. The Selfish Gene: 30th Anniversary Edition. Oxford University Press. ISBN 0-19-929115-2. Gould, Stephen J. 1989. Wonderful Life: The Burgess Shale and the Nature of History. Novi Eboraci: W. W. Norton. ISBN 0-393-30700-X. Jones, S. 2001. Almost Like a Whale: The Origin of Species Updated. Novi Eboraci: Ballantine Books. ISBN 0-345-42277-5. Mader, Sylvia S. 2007. Biology. Ed. 9a. McGraw Hill. ISBN 978-0-07-325839-3. Maynard Smith, J. 1993. The Theory of Evolution: Canto Edition. Cambridge University Press. ISBN 0-521-45128-0. Pallen, M. J. 2009. The Rough Guide to Evolution. Rough Guides. ISBN 978-1-85828-946-5. Smith, C. B., et C. Sullivan. 2007. The Top 10 Myths about Evolution. Prometheus Books. ISBN 978-1-59102-479-8. Darwin, Charles. 1859. On the Origin of Species. Londini: John Murray. ISBN 0-8014-1319-2. Fons interretialis. Larson, E. J. 2004. Evolution: The Remarkable History of a Scientific Theory. Novi Eboraci: Modern Library. ISBN 0-679-64288-9.
Zimmer, C. 2001. Evolution: The Triumph of an Idea. Londini: HarperCollins. ISBN 0-06-019906-7. Barton, N. H., D. E. G. Briggs, J. A. Eisen, D. B. Goldstein, et N. H. Patel. 2007. Evolution. Cold Spring Harbor Laboratory Press. ISBN 0-87969-684-2. Coyne, J. A., et H. A. Orr. 2004. Speciation. Sunderland: Sinauer Associates. ISBN 0-87893-089-2. Futuyma, D. J. 2005. Evolution. Sunderland: Sinauer Associates. ISBN 0-87893-187-2. Gould, Stephen J. 2002. The Structure of Evolutionary Theory. Cantabrigiae: Belknap Press (Harvard University Press). ISBN 0-674-00613-5. Maynard Smith, J., et E. Szathmáry. 1997. The Major Transitions in Evolution. Oxfordshire: Oxford University Press. ISBN 0-19-850294-X. Mayr, Ernst. 2001. What Evolution Is. Novi Eboraci: Basic Books. ISBN 0-465-04426-3. Olson, Wendy, et Brian Keith Hall. 2003. Keywords and concepts in evolutionary developmental biology. Cantabrigiae: Harvard University Press. ISBN 0-674-02240-8. Florentius Facchini, Evoluzione. Cinque questioni nel dibattito attuale, Jaka Book, Milano, 2012, ISBN 9788816411555. Novissima mutatio die 1 Augusti 2017 hora 18:22 facta.